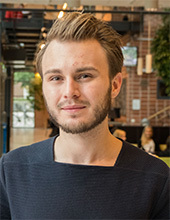 Anton Axelsson is since 2015 employed as a PhD student at the division of organic chemistry. Anton’s research is focused on the development of new methods for constructing organic molecules using organocatalysis and heterogeneous induction catalysis. Green chemistry and new reactivity are key concepts, and are used to improve the sustainability and efficiency in the synthesis of organic compounds, e.g. pharmaceuticals. There might be more projects where Anton Axelsson participates, but you have to be logged in as a Chalmers employee to see them.